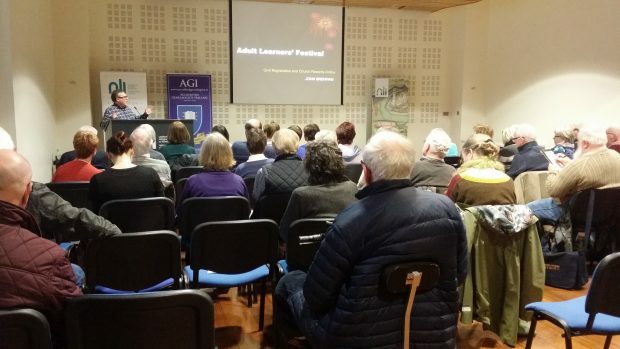 AGI participated in the recent Adult Learners’ Festival in association with the National Library of Ireland. AGI Members delivered a series of lectures and workshops for family historians during the week. The lectures were delivered by John Grenham and Helen Kelly. Both were well attended, with over 60 in the audience. The talks were followed by the workshops, with four AGI Members participating on each day. The members involved were Linda Clayton, Aiden Feerick, Máire Mac Conghail, Hilda McGauley, Nicola Morris, Anne-Marie Smith and Joan Sharkey. This was the third year of AGI’s participation in the Adult Learners’ event and the first time that workshops were included. They proved very popular (even over-subscribed) and hugely successful. Each AGI Member took a group of 9 or 10 and spent two hours discussing their family history research. It was very participative and it highlighted how helpful it is for beginners and experienced researchers to have a forum for discussing their problems and sharing tips.